So i thought i share my first recipe with you. 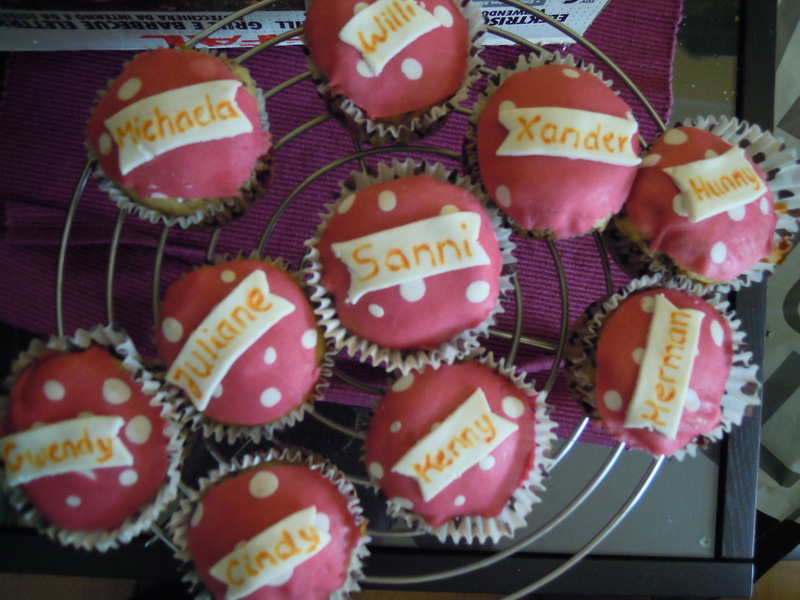 I made them for my Master party and they were really a huge sucess. It is a really basic recipe and i thought its perfect to start with for my blog. Fill the flour, salt and baking powder into a big bowl. Mix the chocolate chips and the sugar into it. Stirr the eggs together with the milk and the oil in a seperate bowl and then add it to the mix. Add then a few pieces of chopped cherries. There is really no definite amount. It depends on how juicy you want your cupcakes really. Now stirr all ingredients until its mixed. Do not stir to long. A few lumps are not a problem. Fill the dough with a spoon into little muffin paper forms and put them for 20 mins in the oven. I bought pink and white marsipan in the store. I then put a clump of pink marzipan in between two layers of plastic bag (you can cut it open so you can remove the finished decoration easier). You then go over it with a baking role until you have a nice flat and even piece. You then add little balls of white marsipan on top of it and roll over it briefly again. You end up with a pink sheet of marsipan with polka dots. You can then cut out circles in the size of the top of your muffins and carefully transfer them with the help of the plastic bag (freezer bags worked the best for me). You can also add little rectangular pieces of white marsipan to write names on it. I found pens to write on cake in the store in different colors. Obviously you can make them in different colors and i am sure alot of you will manage a bit more even polka dot pattern. This ones were my first try :). They really work great as little presents. I used them as table name cards.